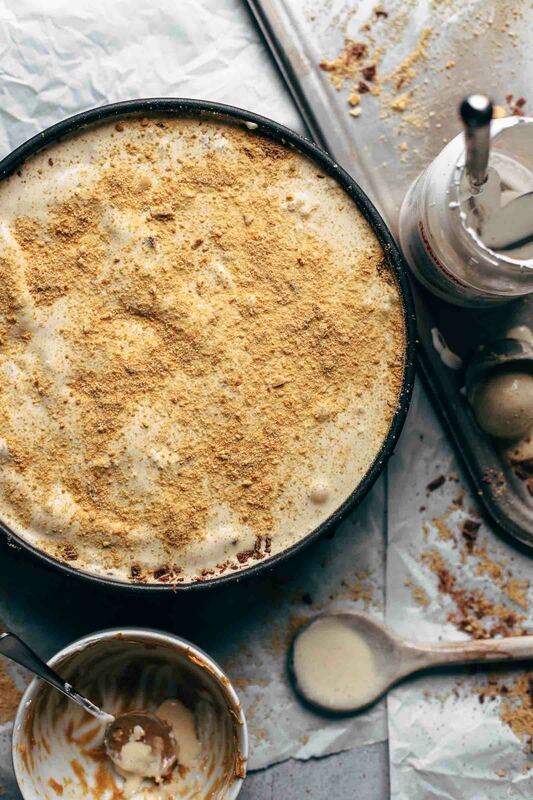 It doesn’t matter whether you love chocolate, S’mores, ice cream, or peanut butter, with this Peanut Butter S’mores Ice Cream Cake recipe you will be satisfied either way. Super simple to make with just 9 ingredients and 10 minutes preparation time. It comes with the easiest homemade chocolate fudge sauce ever. No cooking, no baking. With video! 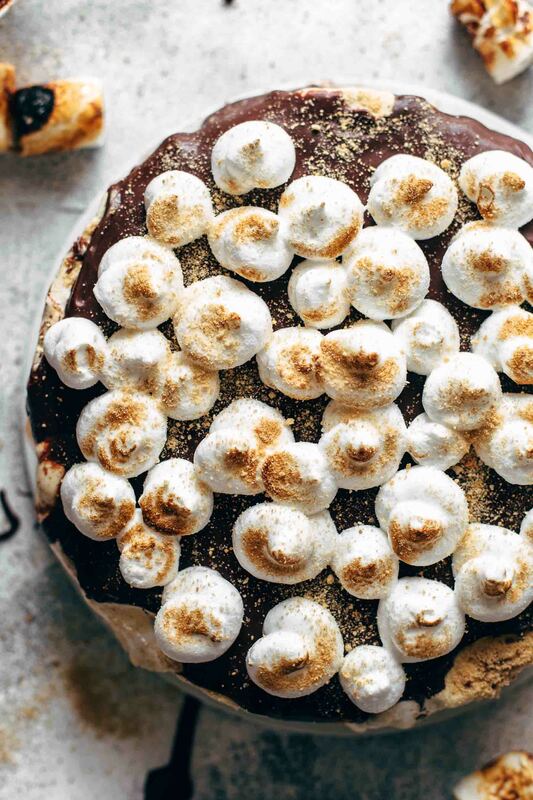 Guys, I can’t tell how thrilled I am to share this amazing Peanut Butter S’mores Ice Cream Cake recipe with you. It was my birthday cake (yes, I made my own birthday cake for myself) and it is the best ice cream or s’mores, or chocolate, or peanut butter, or marshmallow anything I’ve ever had. Because I’m the biggest s’mores fan alive, it was so obvious that I wanted to have a s’mores dessert for my birthday. Btw, my birthday was not that much fun this year. I had to work. Mario had to work. I had to learn. Mario had to learn. Booo. However, I celebrated two days later. Can you imagine how much I had of this cake? You know brain freeze, right? Well, I had this feeling in my stomach. I think it was too much ice cream cake at once for my stomach. BUT, I LOVED IT. And you are going to either. Yes to everything? Welcome to sweet heaven, guys! 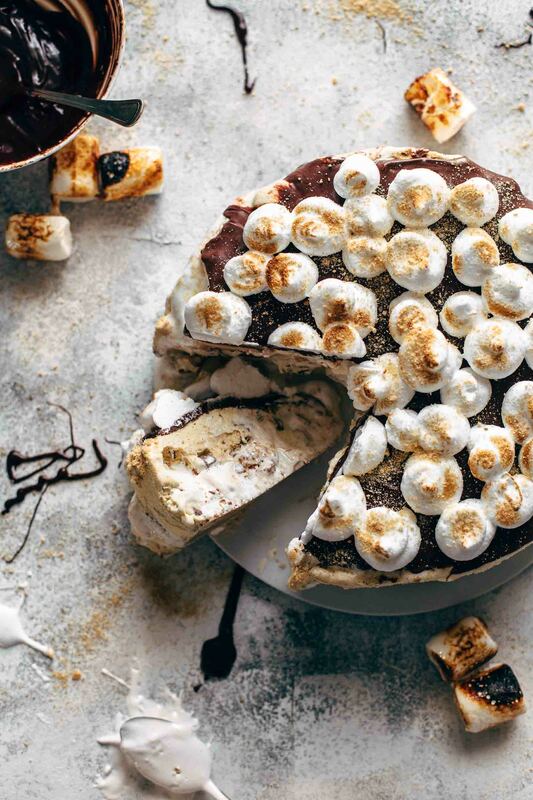 This Peanut Butter S’mores Ice Cream Cake is very easy to make. It starts with a graham cracker crust, followed by vanilla ice cream, marshmallow fluff, peanut butter, chocolate bars, graham cracker crumbs, and homemade fudge sauce. The graham cracker crust is made in minutes with just 2 ingredients. Graham crackers and butter. Smash graham crackers into fine crumbs with a rolling pin and a zip-lock bag or place in a food processor and pulse a few times. Combine graham cracker crumbs with melted butter and press into the bottom of a 9″ springform pan. The crust is done. The ice cream cake itself is as easy as the crust. In a large bowl, stir vanilla ice cream a few times to soften. Then add marshmallow cream and stir until almost combined. It is totally ok when marshmallow cream dots are still visible. You don’t need to work that accurate. Then stir in chopped chocolate bars. Go with the chocolate bars you love the most. Fill about the half of the ice cream into the pan. Spoon dollops of peanut butter and marshmallow cream on top and even just a bit with a spatula or the back of a spoon. Sprinkle with chocolate and graham cracker crumbs. Spoon the remaining vanilla marshmallow ice cream on top and spread evenly. Sprinkle again with graham cracker crumbs. The homemade chocolate fudge sauce is EXTREMELY easy to make. Just 3 ingredients and a microwave needed. Yes!! Homemade chocolate fudge sauce straight out of the microwave. Woohoo. Semi-sweet or dark chocolate, sweetened condensed milk, and heavy whipping cream is everything you need. Place everything in a heat-proof bowl and microwave for about 2 minutes until it has the typical fudge consistency. It is very important that you stir every 20 seconds that the chocolate doesn’t get too fast too hot. 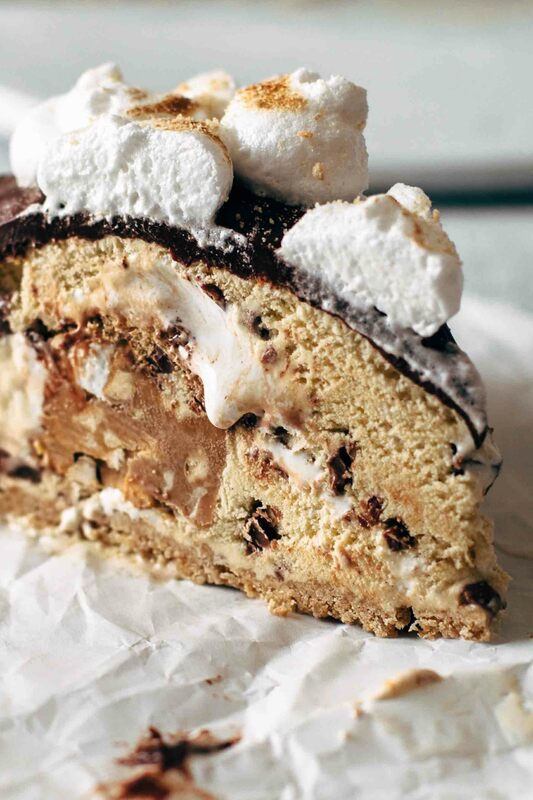 Pour over the frozen Peanut Butter S’mores Ice Cream Cake. You can drizzle it all over, or spread it evenly on top. How you like it. There are no rules. And then freeze it again for about 1 hour. 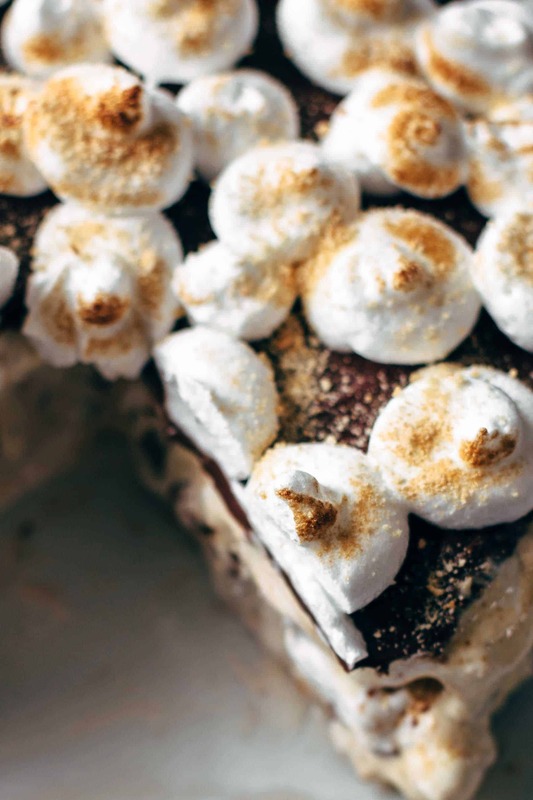 Top your Peanut Butter S’mores Ice Cream Cake with meringue, like I did it, or with marshmallows. Then lightly toast your meringue or marshmallows, sprinkle with more graham cracker crumbs if desired and freeze until firm. The toasting will soften the cake a bit on top. You can also skip the meringue or marshmallow topping. It’s delicious either way. And now the moment has come. You cut into the cake and can see the peanut butter and marshmallow cream swirls. The marshmallow cream doesn’t freeze through. It runs out like from a Fluffernutter sandwich. OMG!! Sweet vanilla ice cream, meets gooey marshmallow cream, salty peanut butter, delicious chocolate, and a crunchy graham cracker crust. 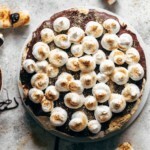 Topped with heavenly chocolate fudge sauce and toasted meringue! I think you know why I had that much at once until my stomach was freezing. The pain was the only reason what made me stop eating. Last year Mario wanted to have Peanut Butter Ice Cream Cake for his birthday. Guess what. This year he wants to have this cake instead. He has birthday in about 7 weeks. YASSSS. 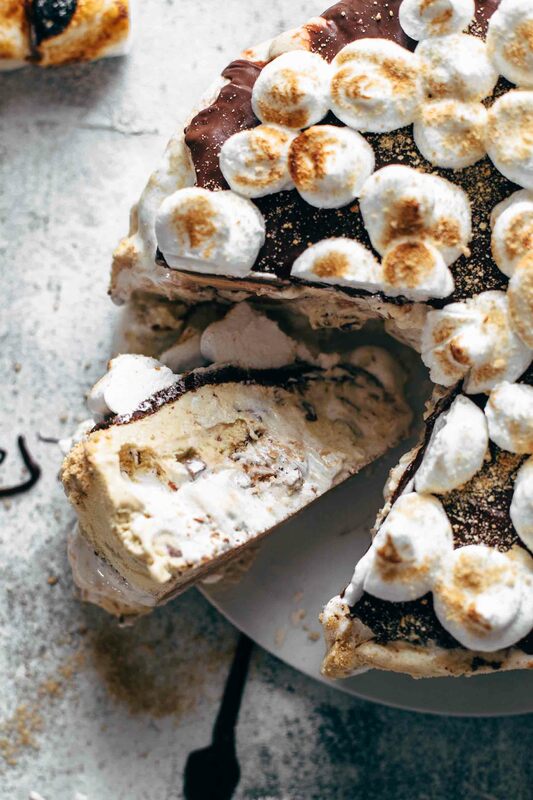 If you try this Peanut Butter S’mores Ice Cream Cake recipe leave a comment, rate it and tag a photo #alsothecrumbsplease on Instagram! Would love to see your snap! 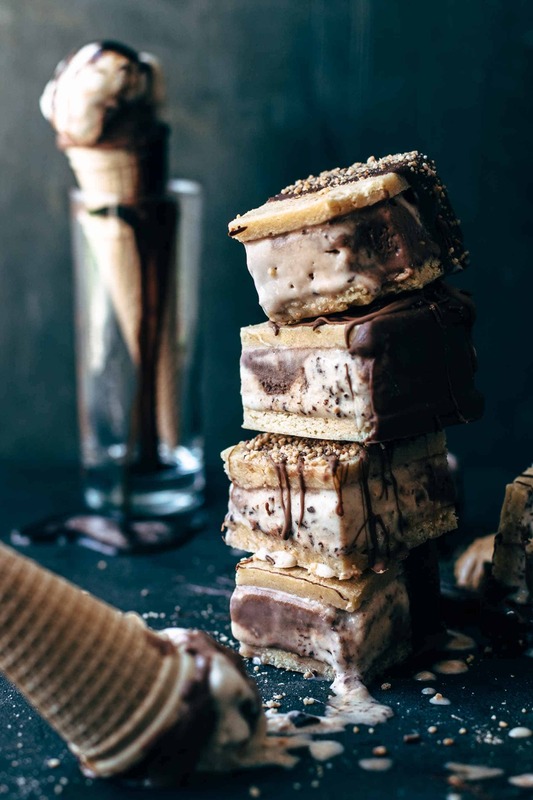 You may also like Ice Cream Cookie Sandwich, Peanut Butter Ice Cream Cake, Black Forest Ice Cream Pie, Tiramisu Ice Cream Cake, or click here to see all recipes. 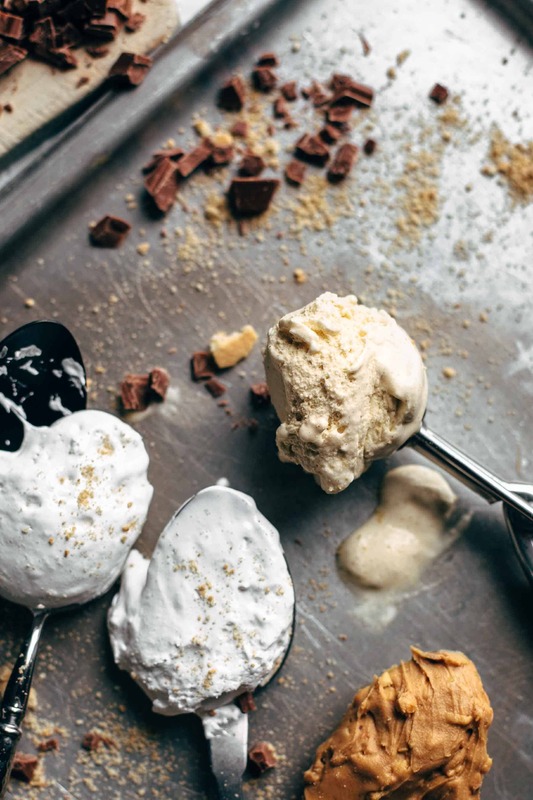 It doesn't matter whether you love chocolate, S'mores, ice cream, or peanut butter, with this Peanut Butter S'mores Ice Cream Cake recipe you will be satisfied either way. Super simple to make with just 9 ingredients and 10 minutes preparation time. It comes with the easiest homemade chocolate fudge sauce ever. No cooking, no baking. With video! Set ice cream on the counter. In a bowl, stir together 1 + 1/4 cups graham cracker crumbs and melted butter until fully combined and evenly moistened. Transfer crumbs to a 9" (23 cm) springform pan press evenly into the bottom of the pan. Just cover the bottom with crumbs, not the sides. Freeze until you are done with the filling. In a large bowl, stir ice cream with a wooden spoon just a few times to soften. Add the half of the marshmallow cream and stir until almost combined. It's absolutely fine when marshmallow cream swirls are still visible. You don't need to work that accurate. Stir in 1/2 cup of chopped chocolate bars. Fill the half of the ice cream into the pan. Spoon dollops of peanut butter and the remaining marshmallow cream on top. Even just a bit with the back of a spoon or a spatula. Sprinkle with remaining chocolate and 1/2 cup of graham cracker crumbs. Spoon remaining ice cream on top and spread evenly. Sprinkle remaining graham crackers on top and freeze for at least 4 hours or until firm. Place chocolate, sweetened condensed milk, and heavy cream in a heat-proof bowl and microwave for about 2 minutes until it has the typical chocolate fudge consistency. Stir every 20 seconds, that the chocolate doesn't get too fast too hot. Pour, drizzle, or spread on top of the cake. Freeze for another hour. OPTIONAL: With a handheld or stand mixer fitted with a whisk attachment, whisk egg whites and salt until soft peaks form. Add sugar and whisk until stiff peaks form. Pipe on top of the cake. 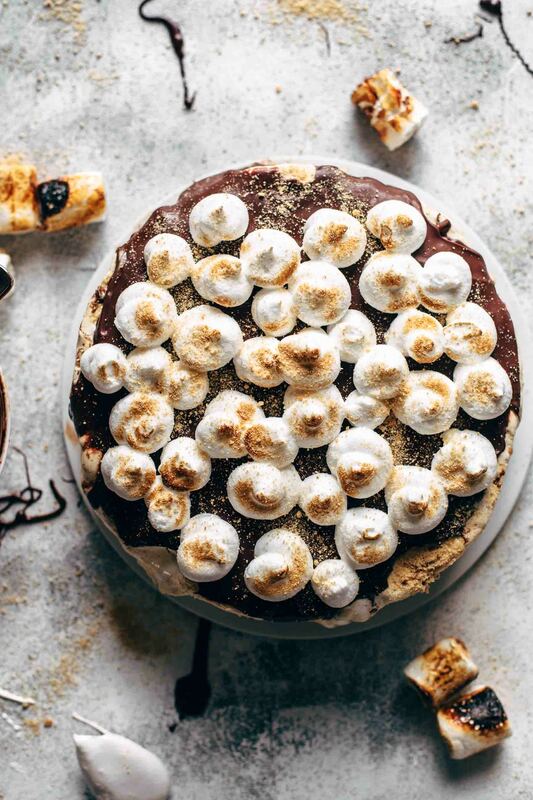 You can replace the meringue with marshmallows if preferred. Lightly toast with a kitchen torch. Freeze again 1 hour or until firm. Store leftovers up to 1 week in the freezer. Dear Sabine: Happy (belated) Birthday! Oh, Amanda! Thank you so much (: You literally made my day and I’m so thankful for your kind words and that you like my blog and my recipes. This means so much to me! I can’t wait to be in San Francisco and I will check out all the popular restaurants and explore the neighborhoods. I’m already in love with the area around Sausalito, Mill Valley, Strawberry… Thank you so much for sharing the link. Have a wonderful day, Amanda!